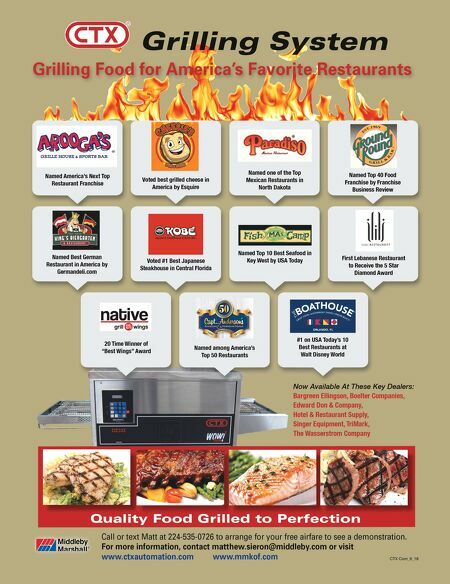 ● ● ● ● ● ● ● ● ● ● ● 74 • FOODSERVICE EQUIPMENT & SUPPLIES • JULY 2018 "This system works because of the rapid-cook ovens and the placement of the equipment and prep spaces," says the project's foodservice consultant, Kevin Cromwell, principal, Cromwell Con- sulting Inc., Stoughton, Mass. "Custom metalwork frames the chef's tables that incorporate prep, plating and heat lamps at three individual side-by-side workstations. The stations are scalable so they can oper- ate with two or five cooks depending on the time of day and meal volume." Students help themselves to beverages such as water and carbonated beverages in the dining area. They also purchase espresso, cappuccino and desserts at Waterbury Café. This op- eration contains an espresso machine, a coffee machine and hot water dispenser for tea. Resin panels below the espresso counter contain coffee beans. A countertop case displays baked goods that staff prepare in the uptown campus bakery kitchen. Cafe managers can also serve as baristas in the espresso bar. All dishwashing takes place in the back-of-the-house kitchen, which contains a flight dishwasher. "The machine's full width is used only when it is filled to capacity, which allows the department to conserve energy and water in non- peak-use periods," Cromwell says. In looking back over the transition period, D'Onofrio notes the challenge of developing cooking-on-demand skills among staff accustomed to batch cooking. "But the new sys- tem has increased the skill set of these workers," he says. 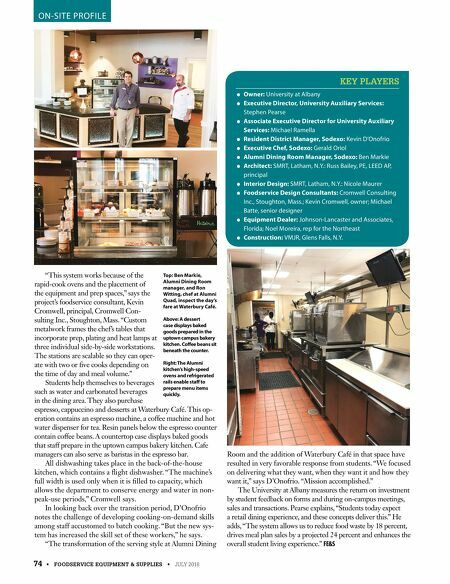 "The transformation of the serving style at Alumni Dining Room and the addition of Waterbury Café in that space have resulted in very favorable response from students. "We focused on delivering what they want, when they want it and how they want it," says D'Onofrio. "Mission accomplished." The University at Albany measures the return on investment by student feedback on forms and during on-campus meetings, sales and transactions. Pearse explains, "Students today expect a retail dining experience, and these concepts deliver this." He adds, "The system allows us to reduce food waste by 18 percent, drives meal plan sales by a projected 24 percent and enhances the overall student living experience." FE&S ● Owner: University at Albany ● Executive Director, University Auxiliary Services: Stephen Pearse ● Associate Executive Director for University Auxiliary Services: Michael Ramella ● Resident District Manager, Sodexo: Kevin D'Onofrio ● Executive Chef, Sodexo: Gerald Oriol ● Alumni Dining Room Manager, Sodexo: Ben Markie ● Architect: SMRT, Latham, N.Y.: Russ Bailey, PE, LEED AP, principal ● Interior Design: SMRT, Latham, N.Y.: Nicole Maurer ● Foodservice Design Consultants: Cromwell Consulting Inc., Stoughton, Mass. ; Kevin Cromwell, owner; Michael Batte, senior designer ● Equipment Dealer: Johnson-Lancaster and Associates, Florida; Noel Moreira, rep for the Northeast ● Construction: VMJR, Glens Falls, N.Y. KEY PLAYERS ON-SITE PROFILE Top: Ben Markie, Alumni Dining Room manager, and Ron Witting, chef at Alumni Quad, inspect the day's fare at Waterbury Café. Above: A dessert case displays baked goods prepared in the uptown campus bakery kitchen. Coffee beans sit beneath the counter. Right: The Alumni kitchen's high-speed ovens and refrigerated rails enable staff to prepare menu items quickly.